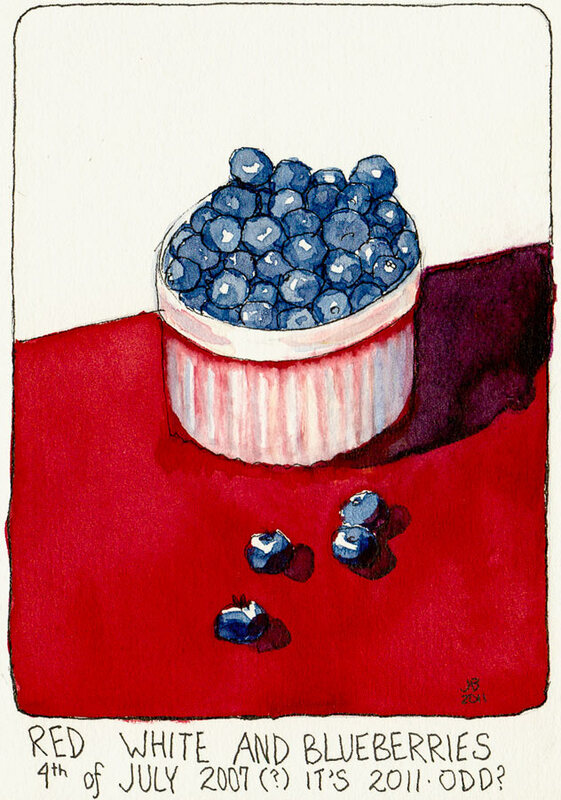 Red, White and Blueberries, ink & watercolor, 7x5"
Happy 4th of July, whether it’s Independence Day where you are not. Why not make every day Independence Day and claim your right to freedom from whatever holds you back? Today I chose the freedom of sketching blueberries in my sketchbook instead of struggling with other “work” I’ve been doing in the studio. I’m also trying to claim independence from the “shoulds” that are telling me I should be at a barbeque, roasting wieners, drinking beer, and waving flags. It looks like the Bay Area will at last have a non-foggy 4th and if so I’ll be heading up to Albany Hill to watch the fireworks around the Bay Area. And now I declare independence from my computer! I loved your red white and blueberries! So fresh, and for a minute there, I thought you actually painted it in 2007! LOL One of these days, I want to come down and sketch with you, too! Glad you declared independence to do your own thing. I hope the fireworks were good.